Tarifas de tren, autobús y barco incluidas. Diríjase a la estación de tren de Bergen, donde subirá a bordo de un cómodo tren para realizar un recorrido panorámico hasta Voss. Desembarque en Voss y suba a un autobús para realizar un recorrido por los pintorescos pueblos de la zona hasta Gundvagen. Entre los meses de mayo y septiembre, el autobús también viajará por la empinada carretera de Stalheimskleiva, compuesta de pronunciados giros y vistas épicas. Cuando llegue a Gudvangen, suba a bordo de un barco para realizar un crucero por los fiordos, declarados Patrimonio de la Humanidad por la UNESCO. Vea tanto el Aurlandsfjord, un pintoresco fiordo que ofrece unas vistas impresionantes, y el Naerøyfjord, uno de los más estrechos de Europa y rodeado de montañas. Desembarque en Flåm, donde podrá disfrutar de otro tren del ferrocarril de Flåm. 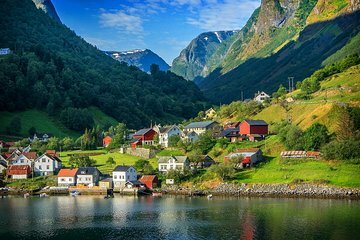 Obtenga unas vistas panorámicas y haga unas maravillosas fotos de los fiordos que le rodean, y bájese en Myrdal. De nuevo en el tren de Bergen, realice el viaje de regreso al punto de partida. The first aspect I'd like to review is the tour company, Easy Travel. The staff of this tourism company are phenomenal. The details of the trip were crystal clear and prompt, the response time great, and the communication professional. Once I managed to mess up and oversleep my train, they worked quickly to fix the problem. They truly went above and beyond to fix my screwup and enhanced our experience by doing so. I can't say enough good things about this company, they are awesome. Next is the tour itself. Each leg of the trip is really magical. I'd never been to the Norwegian fjords before, but this was a perfect introduction to them. Each leg of the trip had a ton of awesome scenery to soak in, so we didn't feel bored at any point. I would have zero hesitations recommending this route to anyone with limited time in Bergen. Book this tour and you won't be disappointed! This was a very long day, however it was a great experience. The train travel was comfortable and very scenic. Very easy to follow directions given to find our way to Flam. The weather wasn't the best, and it was very busy with tourists at Flam. The ferry ride was comfortable, and the scenery spectacular. Absolutely stunning scenery. It is a very full day of primarily sitting. We had some concerns about making the connections between modes of transportation on this tour. That was unnecessary worry on our part. This tour is very well scheduled and organized. Basically a stress free day full of beautiful scenery. The ferry was so crowded as to be unpleasant. The contact person Arthur was difficult to contact, and sparse on details, and he gave us incorrect info on the length of stay in Flam- he told us an hour plus, enough time for lunch and walking around, it was 18 minutes instead. The fiords were disappointing as was the boat ride. The bus was fantastic. The tour was pricey but we covered a lovely part of Norway experiencing everything we had wanted to conveniently.